Retail brokers have been marketing their services via sports sponsorship deals for a number of years now. 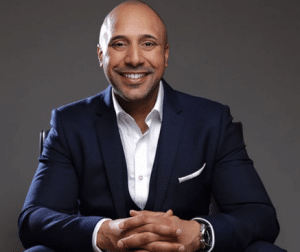 From boxing and polo to Formula One and football, it’s not uncommon for sports fans of all stripes to see Plus500, AvaTrade or eToro logos blazed across their screens as they settle down for some weekend entertainment. Most of these sponsorship efforts are framed in rather vacuous terms. Execution is compared to punching someone in the face and algo trading is used as an analogy for Ronaldo smashing a football into a goal-net. Beyond the PR smokescreen, however, there is certainly huge value in sports sponsorship. After all, brokers would not be splashing out millions of dollars on sponsoring teams and players if they didn’t think they would be getting something in return. What exactly is that return? To find out, Finance Magnates spoke to a number of brokers and specialists in sports sponsorship. As is to be expected of any marketing strategy, brand exposure is a key goal of sports sponsorship deals. In fact, it seems to be the at the top of a broker’s wishlist when sponsoring a sports team or player. A quick look at sports’ viewership numbers gives an immediate indication as to how much exposure brokers are getting. For football, the numbers are mind-boggling. Cumulatively, the English Premier League has an audience of 4.7 billion people across 202 territories. That means that, in a given year, over 60 percent of human beings on earth will watch a Premier League football game. On top of this, the average game is watched live by over 80 million people. So next time you are watching Jurgen Klopp leap into the air or Raheem Sterling miss his 10th chance of the game, remember that more than one percent of mankind is likely watching with you. The numbers are also staggering for Formula 1. An average of 79.6 million people watch each race and, cumulatively, 1.6 billion people, from 200 different territories, watch its drivers zip around the various Grands Prix held across the globe each year. The global reach that sports sponsorship can provide is particularly beneficial to firms with operations around the world. It can also come in handy when firms are looking to expand. 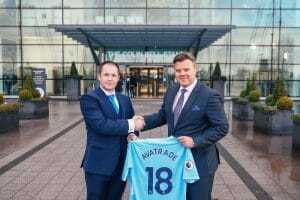 AvaTrade, a broker that sponsors football team Manchester City, has managed to tap into the club’s global audience. 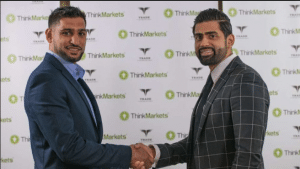 That will come in handy as the broker looks to expand in Asia and Africa. Other brokers may not have such grandiose plans. Nonetheless, sports sponsorship is still a means by which they can spread knowledge of their services, whether that’s within their regulated jurisdiction or abroad. 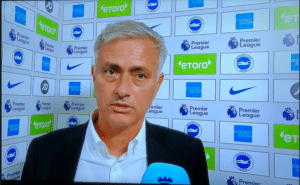 Manchester Utd manager Jose Mourinho giving a post-match interview. 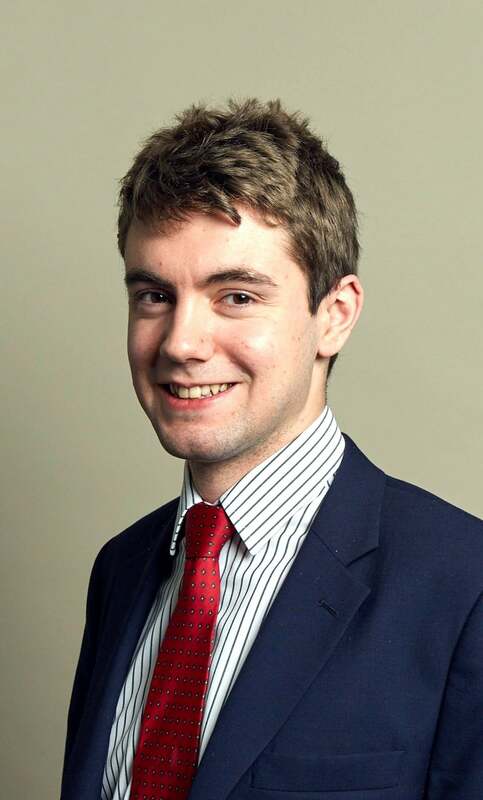 The eToro logo is clearly visible in the background. Exposure to fans via sports events can also help brokers get around existing regulations. Online advertising may be forbidden in China but there is nothing to prevent people in the country seeing an eToro logo at a Manchester United game. His reason? Atletico Madrid, a Spanish football team, had just played the final of the Europa League in Lyon with the Plus500 logo emblazoned across their players’ chests. As I’m sure our readers are already aware, it is illegal for CFD brokers to advertise in France. Aside from annoying regulators, brokers can also target more niche audiences with their sponsorship efforts. For many brokers that ROI is attracting a more high-end clientele. ICM Capital, for example, has sponsored the England Polo Team, an extremely bougie cycling event and Fulham Football Club – probably the poshest football club in the world. ICM did not respond to Finance Magnates for comment but it seems very probable that their sponsorship of ‘high-end’ events and teams is aimed at attracting a posher client base. ATFX, another retail broker, has pursued similarly opulent sports sponsorship opportunities. Just last month, the broker announced that it was sponsoring the Duke of Edinburgh Cup, a charity golfing tournament started by Queen Elizabeth’s husband, Prince Philip. “Improving the lives of young people” may sound like a PR-spin but it’s worth noting a couple of positive macro effects of sports sponsorship efforts. Firstly, if firms genuinely do sponsor charities, that money does go to charitable organizations. This calls to mind Sam Harris’ bravery paradox. You can’t fake being brave because even if you fake acting bravely, you are still acting bravely. Similarly, brokers such as ATFX or ThinkMarkets may be using charitable donations for the positive PR. Nonetheless, they are still giving money to charities and so charities will benefit from their money. For the industry as a whole, sponsorship efforts raise awareness about retail brokers. When Plus500 is splashed across Europa League football fields, people will be curious as to what it is they do. Some brokers even claim that this is part of their goal. Again, the bravery paradox applies. Whatever the case, sports sponsorship looks here to stay. 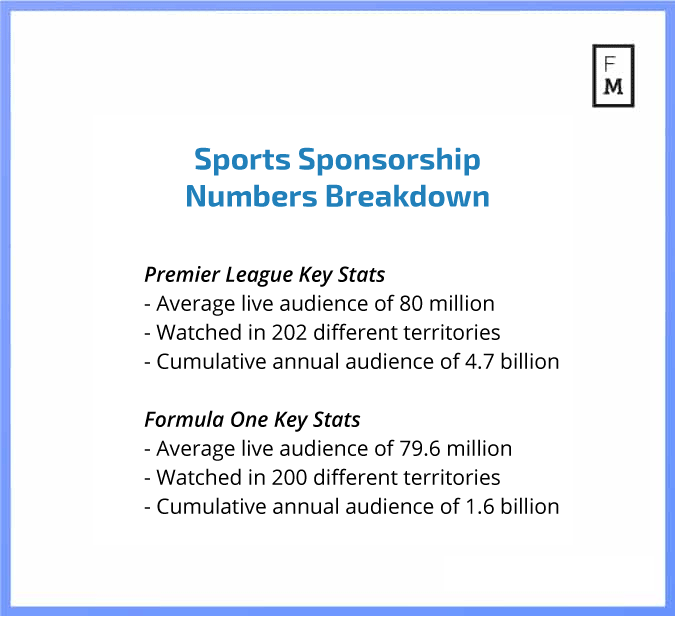 The viewership numbers in and of themselves are enough to justify sponsorship of sports teams. When you add regulatory loopholes, the ability to expand with a team that has global reach and any positive PR that may come with such deals, it’s easy to see why so many brokers are keen on them.